What Type Of Visa Should You Procure? Heuristic researchers need not procure academician visa in particular to read up at Cosmos International University because it's not a regular university where you have to go for classes like the ones you have in your country. Therefore, any other appropriate visa for securing a job or employment which will help you to earn a good salary during your study at Cosmos International University will be a better option. At the same time, we will not offer any degree to anyone if heuristic researcher's occupation is merely manual work unless it is part of the course work he or she has to mug up. It means the researcher does not merely meet the admission requirements but also is unable to maintain the yardstick of the university. A UNHCR Card, World Citizen Card issued by World Government of World Service Authority, work permit, resident permit or visa of a country will be acceptable regardless of a person's country of origin. Why Entitled Cosmos International University? In the get-go, the university was entitled Free International University(FIU). But because of some universities that have indistinguishable title already existed in other countries, the President and Director of CIU and CDIM concluded to metamorphose the university's name different and unique. 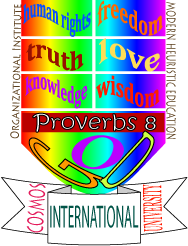 Eventually, Cosmos International University(CIU) was validated in June, 2005.